My resolution to use as much as possible of my bursting-at-the-seams vintage fabric stash has turned me into a doily factory archaeologist. I've been digging down through the layers in order to perform a fabric cabinet excavation and so far lots of long forgotten 'good stuff' is coming to the surface. Tomorrow, some of the results of my de-stash resolution will be available in my etsy shop at 10 am PST. Rain or shine. If you're in the area, I hope you'll stop by. The things you make are so beautiful. I love color and of course much of what you do is very colorful. I will check out your shop tomorrow. These are so cute! Come finish up my stash too! Your pillows are just wonderful, you do an amazing job! Oh Amy, I just love what you make! 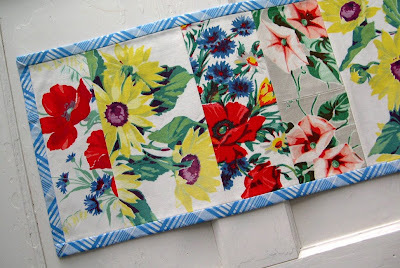 You have such an eye for putting these vintage fabrics together. I can't wait to check out your new vintage line! I surely love what your doing, just gorgeous!! I thought of you when the sun came out on Thursday. It almost -- almost -- felt like spring. I love your pillows. 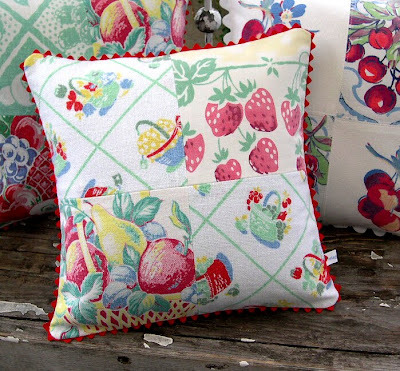 Speaking of fruit not available here yet, -- I'm already dreaming of our cherry season. I went cherry picking up the hill from my place for the first time last summer and it was the best fun I've had in ages for 50 cents a pound!!! Love the new shop items! Absolutely beautiful. Again with the outdoor photos! 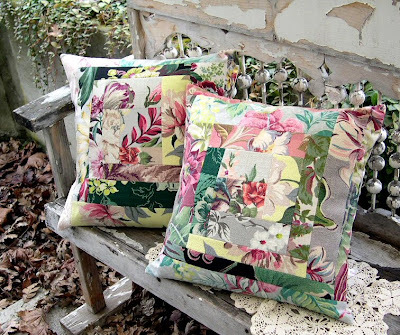 They (the pillows and the photos) are just lovely. 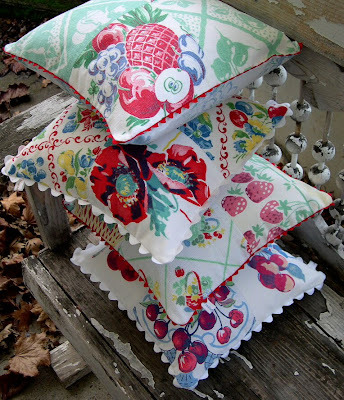 Your vintage pillows are gorgeous!!!! Love them! Oh I love "pretend it isn't winter!" Love it! !